Do you like the taste of chocolate and peppermint together? 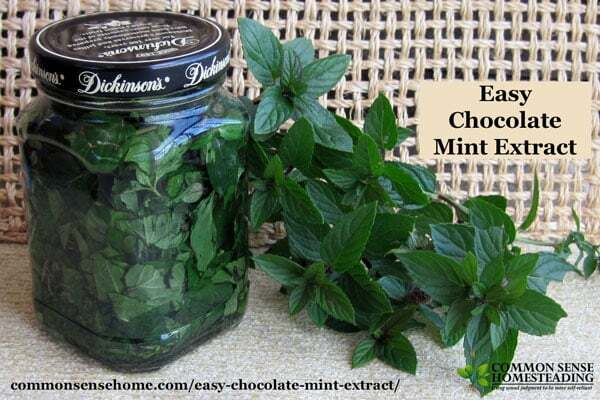 Then you should enjoy this easy chocolate mint extract recipe. It's made in a similar manner to the vanilla, almond and lemon extracts. (Check out the other homemade extract recipes here.) 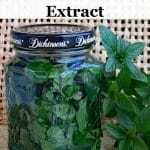 I use the chocolate mint plant as the basis for my extract, but peppermint will also work in combination with cacao nibs. Homemade extracts are great for holiday gift giving. The flavor gets stronger the longer you allow the extract to steep, so make sure to plan for at least 6 weeks of infusion. I haven't purchased commercial mint extract in years. You can use your homemade chocolate mint extract for all sorts of things. Add a little to your brownies, hot chocolate or hot chocolate eggnog, ice cream, homemade peppermint patties – use your imagination! Harvest mint in the morning after the dew has cleared. Remove any spoiled leaves and debris, rinse with cold water if needed and pat dry. Keep in mind that any excess water will dilute the extract and may lead to spoilage. Get your leaves nice and dry before chopping them for extract. We've have a LOT of rain here recently, so I didn't bother with a rinse. I snip off the tender tops, and then strip the rest of the mint leaves from the stem by running my hand from top to bottom. Chop the mint leaves coarsely to create more surface area. A little rough handling/smashing as you pack them in the jar also helps release the oils. Add 1 tablespoon of cacao nibs per cup jar for chocolate mint extract, if you are using peppermint leaves, or if you'd like to add a little more chocolate flavor to your chocolate mint. Fill jar with vodka to cover the mint leaves. Place lid on jar. Store out of direct sunlight, stirring or shaking daily, for 6-8 weeks. Longer is better if you have the time. Strain out the mint leaves and cacao nibs with a fine mesh strainer, cheesecloth or flour sack towel. Store in a dark bottle out of direct sunlight. Click here to order a set of 4 ounce dark bottles. You can use a similar method with whatever sort of mint you have on hand. (I do think catmint might taste a little funny.) Spearmint, gingermint and applemint would be lovely, I'm sure. (There are over 600 varieties of mint, so you have a lot of options.) Don't have fresh mint? 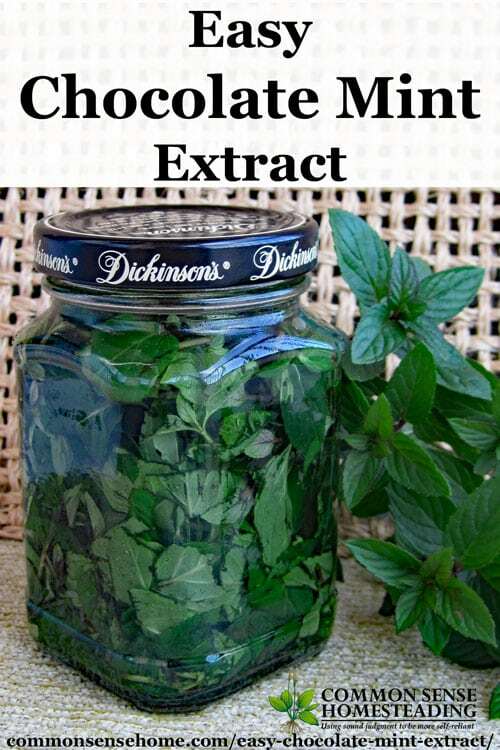 You can also make mint extract with dried mint. Can't find chocolate mint at your local nursery? 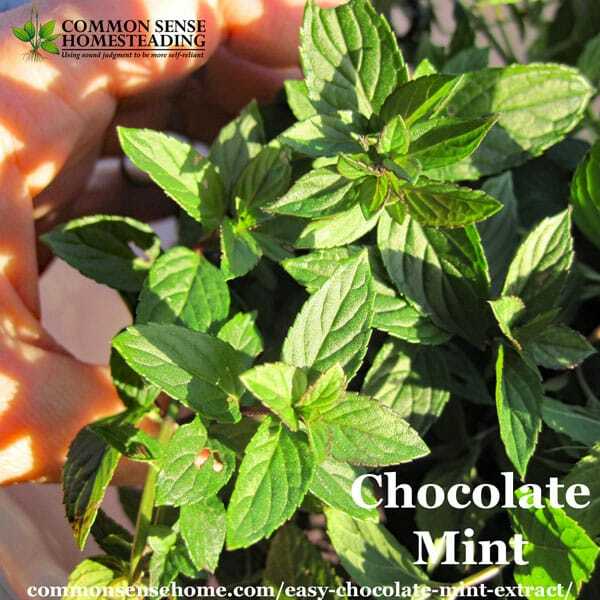 Via the wonder of the internet, you can order a chocolate mint plant online. What's your favorite low maintenance herb, and how do you like to use it? It's always a pleasure to exchange information and get new ideas from our readers. Easy chocolate mint extract made with fresh mint leaves and cacao nibs. Strain out the mint leaves and cacao nibs with a fine mesh strainer, cheesecloth or flour sack towel. Store in a dark bottle out of direct sunlight. 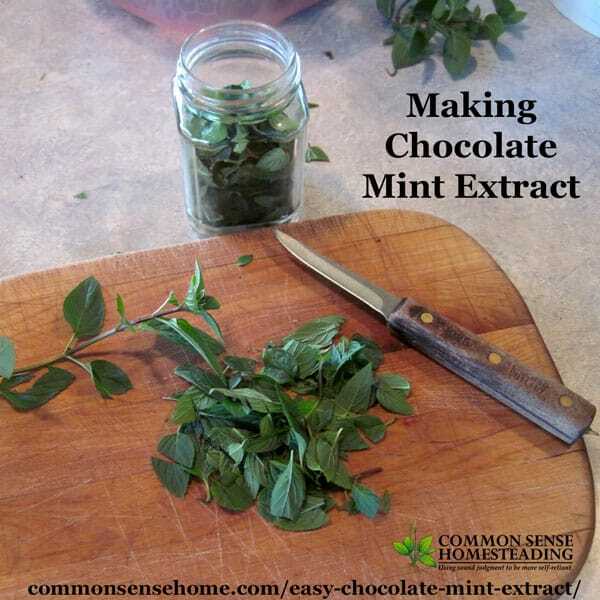 Use in your favorite recipes that call for mint extract, or anywhere you'd like a little chocolately-minty flavoring. Originally posted in 2014, updated in 2017. Once you’re done infusing the mint, strain out the leaves and nibs and store in a dark bottle. You can use it right out of the bottle with the leaves in it, but this can be messy. Typically, you’re only using a small amount in recipes (a teaspoon or less), so you wouldn’t be adding a significant amount of alcohol. If the recipe is heated, the alcohol should evaporate during cooking. For adding flavor to something like a cup of hot chocolate, you’d add only 1/8 teaspoon – maybe even less depending on taste and the strength of your extract. You can also use vegetable glycerin as a base instead of alcohol, but in my experience, glycerin based flavorings have a much shorter shelf life, whereas alcohol based extracts last a very long time. I love using both Chocolate Mint & Lemon Balm for this purpose! I actually like to add sugar or honey syrup after I strain the leaves and use it as a liquor. Not everyone imbibes but this makes a pleasant winter drink in hot chocolate or just to sip occasionally. Or in sparkling water in the summer. Store in half pint canning jars but no need to seal. The longer you let it set in a cool dark place, the better it gets. Put a half teaspoon of spearmint extract in a 2 quart pitcher of green tea. My whole family loves it, including the 2 toddlers. I always make my tea this way. Don’t forget to add the sugar. Interesting. I could see how mint would brighten the flavor of the tea. You can often find them in organic/natural foods groceries. If you don’t have them available locally, you can order them online, such as these cacao nibs on amazon. Thanks for this easy chocolate mint extract recipe. How can I make chocolate and coffee extracts without using alcohol, what proportions of ingredients would I need? You could try something with ground cacao nibs for a chocolate flavoring. Would it be possible to use glycerin & can this for long term storage or gift giving? i don’t believe that would be effective, as the heat required for the home canning process would drive off the volatile oils that provide the flavor. Even commercial flavorings have a much shorter shelf life than extracts. Laurie, I started making this on my own and then went looking for your recipe. My chocolate mint leaves — after a month of steeping — taste more peppermint than chocolate mint. I’ve just added some chocolate nibs to the jar with the mint leaves. Will the chocolate actually steep in the alcohol? I never thought of that until I read your post. Do I need to add sugar to this once I strain it or do I just use the infused alcohol as the flavouring. I wonder if it would make a nice liqueur? Have you tried that? I haven’t added sugar to mine since I’ve just used it for flavoring. The nibs will add a little chocolate flavor, but not as strong as commercial chocolate extract. I have had mine in a jar for about 3 weeks and the mint leaves are tuning black. Is that normal? That hasn’t happened for me. Usually the color just fades over time. Does it smell “off”? Mine did the same, I was afraid to use it so I threw the whole thing out. Did you use just mint leaves or mint and cacao? Were the mint leaves completely dry before chopping? Did it smell “off”? Trying to figure out what might have gone wrong. I added a note to the instructions about making sure the leaves are completely dry before chopping. Mine turned brown… it didn’t smell bad, mostly just like vodka. I haven’t used it yet though. I’ve never heard of a Chocolate Mint plant before, but it sounds pretty interesting! How “chocolaty” is your Chocolate Mint, naturally? Is it just barely perceptible, or pronounced? The chocolate aspect is subtle but noticeable. There really is a more “peppermint patty” flavor to it. It is distinctly different from my peppermint and spearmint plants. When making Stevia extract you have to boil the liquid to make an extract. This recipe there is no boil. I was curious because we are considering making both. Thanks. I don’t boil my stevia extract, I only cook it down gently to concentrate it. You could do the same thing with the chocolate mint if you wanted to do so, but the mint leaves have a stronger mint flavor than the sweetness level of the stevia. My 10yo got to pick one plant this spring and she chose the chocolate mint. It stayed small in its original pot, it took us a few weeks to plant them in bigger pots. That thing took off in a larger pot lol. It’s over flowing on the third pot it snuck into. I’m glad I saw this post on pintrest, I had no idea what to do with it. Thanks! You’re welcome. It makes a pleasant herbal tea, too. How do you make tea from the mint chocolate plant? To make tea from the fresh leaves, start with around one to two tablespoons of leaves. Rinse them off if needed. Chop or crush to help release the oils. Place the leaves in a mug and cover with boiling water. Cover with a small plate to trap more of the aroma, if desired. Steep for at least 3 minutes, 5-10 is better. Strain out leaves and enjoy. I did it! Took me all summer and fall, and tastes awesome. Very minty! My leaves did turn brown but it’s bc it sat under my counter for months. It tastes like extract. I had a chocolate mint plant that went nuts so I had a TON. However, I came on here to see how you dispursed it. I was hoping to give it as a gift for people in 1 oz vials. But wasn’t sure if anyone else did this? Just curious if there’s any suggestions for this. Seasons greetings! For home use I typically reuse old extract bottles, but you can purchase pretty new small bottles in a variety of colors and sizes – labels, too, if you like. You may be able to find them locally if you have a “crunchy” store near you that sell products for DIY herbal/health people, otherwise they’re available online. I made mine too and had no problems this time with the leaves turning black. I made it in a smaller glass container and made sure all the leaves were covered with vodka and like Christi I forgot mine for months and tasted it and didn’t care for it. I think I’ll just stick with store bought and not use my chocolate mint for that.